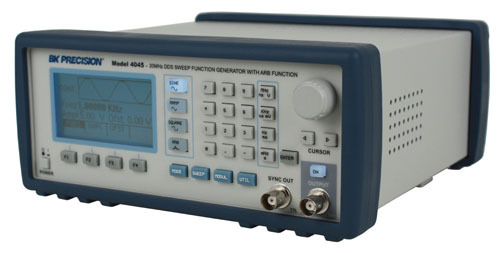 Entry-level programmable DDS Function Generator with easy-to-read color LCD display. 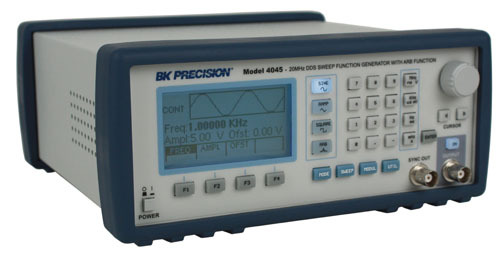 Capable of generating sine and square waves up to 20 MHz and basic arbitrary waveforms (1k memory). 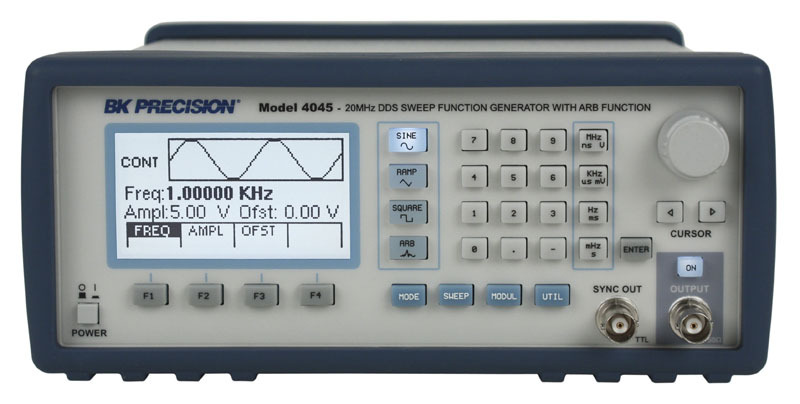 The model 4045 DDS Function Generator is a must have for anyone needing a low cost, full featured direct digital synthesis (DDS) function generator with arbitrary waveform capabilities. The 4045 has a menu-driven front panel interface that includes a large, easy-to-read graphical LCD display. Waveform parameter changes and data entry can be made using the rotary knob or via the built-in USB interfaces. The unit generates superb quality waveforms with high signal precision and stability. It provides sine & square wave outputs over the frequency range from 0.1 Hz to 20 MHz in one extended range (triangle/ramped wave outputs to 2MHz). Arbitrary waveforms can be edited from scratch or by modifying standard waveforms. A full range of triggering capabilities is available, including internal-external trigger source, gated and burst modes of operation.